7 emergency baking substitutes for buttermilk, whole milk, molasses, sour cream, cake flour etc if you are an impulsive baker. I’m not one for baking everyday, but when I do, it’s mostly impulsive. And that means, never having all the ingredients on hand. I end up substituting along the way, which I’ve heard is a big no-no in the baking world, but works for me. I mean when a girl wants cake, she wants it NOW! And while 2 minute microwave mug cakes rule my world, sometimes I crave for the real thing! 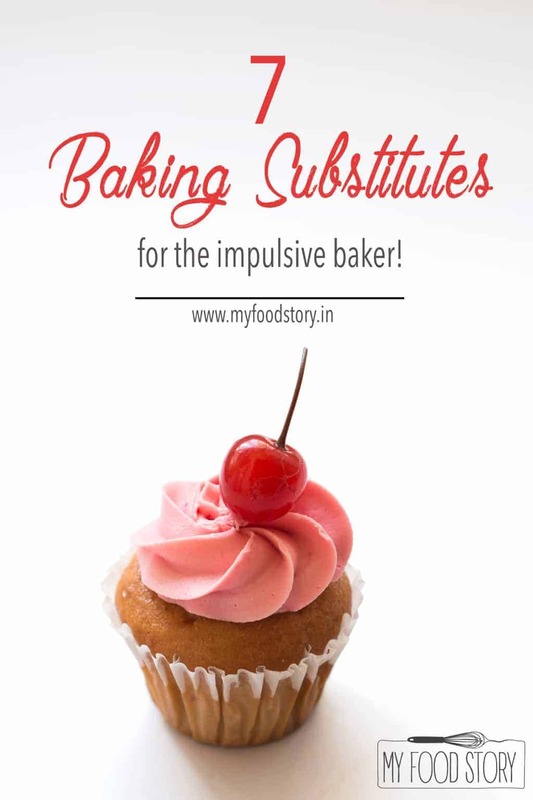 So here’s a list of my top 7 baking substitutes for the impulsive baker, that’ll rock your world! I love your baking substitutes post. I really need this as I somehow end up baking recipes that call for buttermilk, cake flour and self raising flour. Thanks so much for this very imp post for home bakers like us baking on a budget most of the time. Hey Meghna, buttermilk is the whey that you get when you make butter from cream. Hi..just wanted to know that butter milk is our homemade paneer? Thank you Alka 🙂 I’m happy you found this useful!